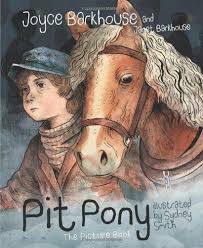 This new, illustrated version of the previously published Pit Pony retells a story first told by Joyce Barkhouse for slightly older readers. After a mining accident that injured Willie Mclean’s father, leaving the family without an income, eleven-year-old Willie is forced to leave school and go down the mine himself. Already unhappy about this change in his life, Willie also has to endure the bullying of Simon, an older boy who works in the mine. The only good thing about this turn of events is that Willie manages to get a job working as a driver with Gem, one of the Sable Island horses he had earlier tried to save from a life in the pits. When another mining disaster strikes, Willie and Gem risk their own lives to save Simon and are declared heroes. Gem does not survive the accident, but her newborn foal does, and is given to Willie in recognition of his courage. Classroom Connections: Through the rich text and equally informative illustrations, Pit Pony: The Picture Book will help younger readers learn about the lives of coal mining families in eastern Canada in the early 1900s. This story also touches on the history of Sable Island and the wild horses that were removed from the island and used in the coal mines of Cape Breton. Children could be encouraged to compare their lives with that of Willie, and to discuss how they feel about Willie, Simon, the bullying and Willie’s decision to help Simon.